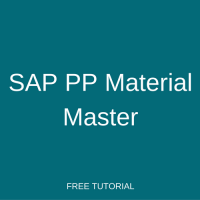 In this tutorial, we will discuss and learn about SAP PP material master data. A material master in SAP represents a product or service that a company purchases, manufactures or sells. SAP ERP systems keeps all the information about a single material in a so called “material master record” or in short “material master”. Different departments of a company need to store various information about a material. For example, the customer service department needs to save information about the aspects related to sales of this material. On the other hand, production and planning departments also need to store specific information about a given material. For this reason, the SAP material master is divided in several views that correspond to a particular business function within a company. Depending on the material type and industrial sector, we can restrict material views and fields. E.g., material type ROH which is Raw material type enables Purchase, Production and Accounting views, whereas material type HALB which is semi-finished product enables Sales, Purchase, Production and Accounting views. The same way industrial sectors will enables specific fields in Material master. Depending on procurement method of materials (purchase or production or trading) a suitable material type has to be selected. Material master contains information related to planning and production execution. How to Create SAP PP Material Master? We can also directly access the transaction by typing MM01 transaction code. The system will show the initial screen of MM01 transaction. Here Material number can be external or internal number. Depending on business requirement we choose the suitable number range. Definition of a number range is specific to a material type. We can define different number ranges for raw materials and finished products. 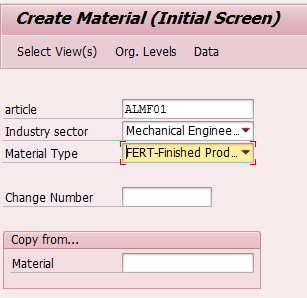 Next, the SAP system will show the window to choose views of the material master that we would like to create or edit. We can also do mass changes of the material master particular fields using transaction MM60. Next, let us talk about some of the important fields in MRP and work scheduling views. 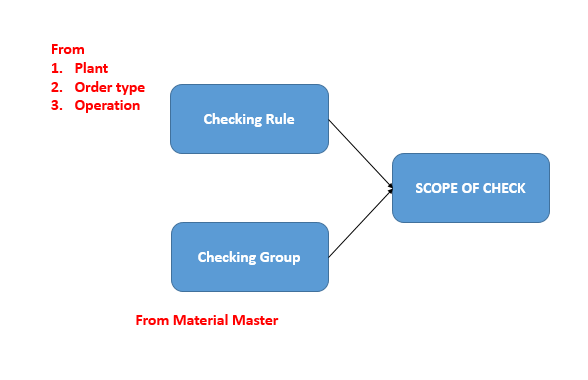 MRP (Material Requirement Planning) procedure in MRP1 view determines how the material will be planned during MRP run. Planning procedure “MRP” plans the material according to current requirements. The requirements may be a sale order, a production plan or a sales plan. Planning procedure “MPS” also plans the material according to current requirements. The requirements may be a sale order, a production plan or a sales plan. The difference between MRP and MPS planning procedure is that MPS material will be only planned in foreground/interactive mode. Material which are critical or used in bottleneck resources or influence the company inventory cost can be defined as MRP and planned separately. MRP will not plan MPS item as it needs separate attention of the planner. Planning Procedure “Consumption based planning” plans the material based on its historical data or past consumption data. A reorder level of the material will be set based on its past consumption history manually or automatically (by forecast). Here reorder level is based on the past 6 month historical data. In automatic planning scenario, the system will arrive to this reorder level from the forecast run. But in manual planning scenario, reorder point will be calculated by planner manually and the value will be manually set in the material master. Planning time fence is period in days where system will disturb the current planning situation or existing planning situation. This topic will be explained in details in MRP lesson. Lot size information here will be used at the time of planning to calculate purchase or production quantity. Lot sizing Procedures are here classified based on Quantity, Time and Cost. Procedure Usage Procurement quantity is calculated based quantity information maintained in material master In period lot size, system groups the requirement quantity which are in the particular time interval. (Week, Month, etc.) It group the quantity so that costs (setup, lot size independent costs) are minimized. Depending on the lot size some of the fields are required to be entered. Next, let’s have a look at the MRP2 view of SAP PP material master. Depending on the procurement type the system will create either a Planned order or a Purchase requisition. This is also applicable for the component of an assembly or finished goods. If raw material is batch maintained, when should the batch entry, i.e. batch number assignment for consumption to be made? 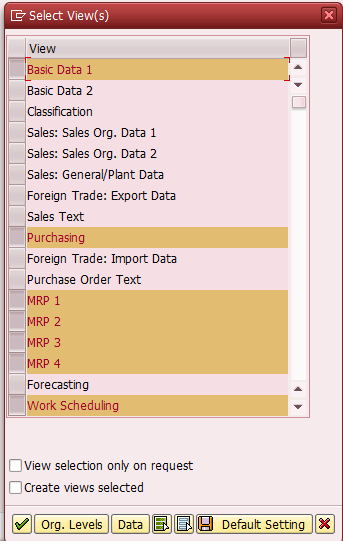 Automatically when an order is released based on the search strategy and the sort rule. If material is a component of an assembly, this fields refer to ‘Issuing storage location”. If material is an assembly or finished material, this fields refers to ‘Receiving storage location”. This field is used in KANBAN replenishment process. This is an area where material will be kept for consumption. It helps to create KANBAN control cycle between Vendor and Production area. When system creates Purchase requisition after MRP, this storage location will be assigned automatically as a receiving location. Number of days required to produce the material. This is based on work days specified in factory calendar. This is lot size independent, i.e. for any of the order quantity the system uses this value only. This is number of days required to receive the material, when it is purchased externally after placing the order. This value is in calendar days. This is the number of days required for inspection and placing the material in a storage location. This value is in calendar days. This is useful when we plan materials using time-phased planning. Some materials may be delivered by the Vendor on specific day or date, e.g. every Wednesday or on the 10th of the every month, etc. This type of material will be scheduled based on planning calendar. Planning calendar has to be created in separate transaction (MD25) and assigned here. Safety stock will be used in case of any sudden or unexpected demand. We can set the safety stock manually. Also, it can be calculated automatically based on forecasted value(s). Behavior of individual strategies will be explained in tutorials about demand management. At the time of production order creation. At the time of production order release. We can activate dynamic availability check at the time of goods issue (optional). Availability check is based on the scope of check that we define in customizing of SAP ERP. 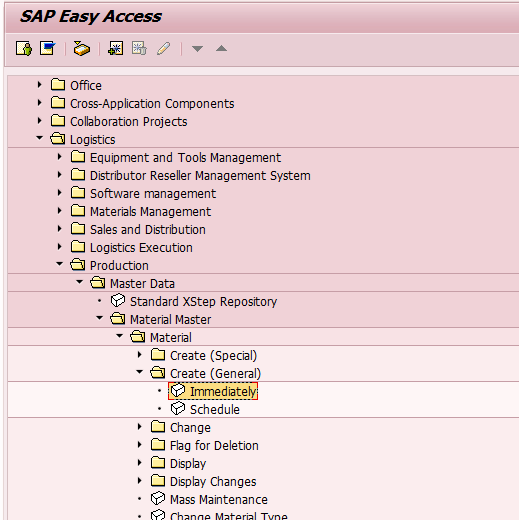 Having finished with discussing MRP3 view of SAP PP material master, let us proceed to MRP4 view. Some partial quantity of the components may become scrap at the production due to its nature or operation nature. These kinds of materials need to be planned in more quantities than the requirement. Percentages in this field will be used for this purpose at the time of MRP run. Assembly FG001 required raw materials RAW1 and RAW2. Let say we defined component scrap for RAW2 as 10%. Demand is coming for FG001 for the quantity of 100 PC. This determines whether requirements for this material have to be started individually or collectively. This indicator will be only used when assembly or components are planned separately and we don’t want the system to plan them based on dependent requirements created for finished material requirements. This applicable only for Make-to-stock production. This section will be used when you want MRP to plan a different material instead of the material in subject after effective out date. After this date stocks of this material should not be exist and the system will replace it by the follow-up material. This view completely controls the production order and its execution. Some of the important fields frequently used in any organization are explained here. This field controls, when we don’t want a particular department or function in an organization to use this material. For example, when you want to restrict production activities for a material which is under design or development in R&D department, we can set an appropriate status. We can also define our own plant specific status in SAP customization. We can also maintain Valid from date from which this restriction will be applied. When you want to use a different unit of measurement other that Basic UOM, we can maintain it here. A person responsible for the production activity and scheduling for this material. We can define which business transactions need to be executed during Production order processing. For example, printing of shop floor paper which contains operation, raw materials required, and user instructions after release of the order. If batch or serial number is required for the material, we can define them in this view. We can define here, the percentage above or below the quantity that can be posted when we do goods receipt against production order. Unlimited indicator will allow system to do GR (goods receipt) irrespective of the order quantity. In MRP2 view, we defined the in-house production which is lot size independent, i.e. for any of the order quantity the system uses this value to calculate planned end date. If you want the system to calculate it with respect to the lot size, we can also define here. It is really very helpful and the way of explanation is very nice. Lesson completed; very good information. very good contents and its well explained.